Ugh! Back when tickets were going to be up for sale for the general public wanting to attend Iron Maiden‘s latest stop in Toronto, I got busy with work and it was only hours later that I went on ticketmaster.ca to purchase a ticket for the show. Clearly, this was not the group to make such a mistake. The prime tickets in the general admission area would surely all be sold out and I would have to find a seat somewhere in the upper areas. For those familiar with the Budweiser Stage (formerly the Molson Amphitheatre) — note the different beer sponsor — there’s usually a general admission area followed by seats in the 200 level, 300 level, 400 level and standing in the lawn area (where you kind of need binoculars). Similar to the Metallica concert, given that I could not bank on Live Nation to provide Sleaze Roxx any sort of media accreditation (you usually only get notified in the day(s) leading to the concert), I wanted to purchase a ticket to see my beloved Iron Maiden. 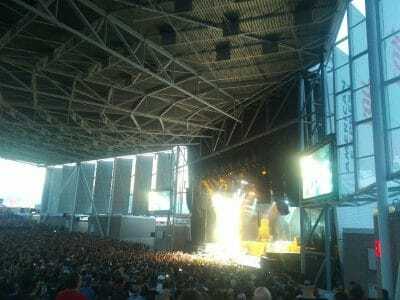 Ever since Iron Maiden reunited with singer Bruce Dickinson and guitarist Adrian Smith in year 1999, I have been at all Iron Maiden tour stops that have passed through Toronto since year 2000 and I wasn’t about to take the chance that I’d miss out in that regard. I was able to find a ticket in the 300 section and as you can tell from my photos of the concert, I had a side angle vantage point to the stage. Unfortunately, I ended up missing Ghost who I wanted to check out for their theatrics way more than their music. 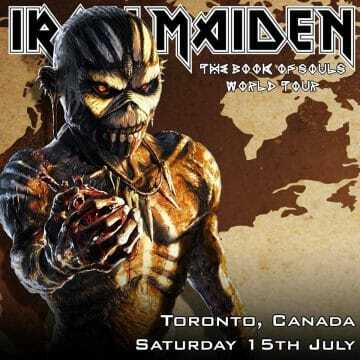 While I was very appreciative of Iron Maiden deciding to come back a second time to Toronto during their The Book Of Souls World Tour, I was really hoping that the group would change its setlist up from the last time they played Toronto. I knew that Iron Maiden would be playing lots of material from their latest studio album The Book Of Souls and even though I hadn’t yet really got into the record, I had found the songs to be “alright” to “good.” Frankly, I haven’t been enamoured by any studio album that Iron Maiden have released since 2003’s Dance Of Death. All of the albums after that one — 2006’s A Matter Of Life And Death, 2010’s The Final Frontier and 2015’s The Book Of Souls — have been decent in terms of songs but I rarely feel the inclination to listen to them despite giving them many listens when they were each first released. All this to say that I respect Iron Maiden continuing to move forward by plugging their latest songs and not doing greatest hits tours time after time but I would be lying if I stated that I wanted to hear the same amount of songs this time around from The Book Of Souls live as back in April 2016. As the traditional Maiden last warm-up song “Doctor Doctor” was blaring on the PA system before the veteran group hit the stage, I could feel goose bumps coming onto my arms. The same type of intro as last time Maiden rolled into town was next with Dickinson singing the intro over some sort of crystal ball or whatever that was — it was kind of hard to see from my vantage point — before the rest of the group launched into “If Eternity Should Fail” from The Book Of Souls. Next up was “Speed Of Light” which saw Dickinson come down from the huge upper sections of the stage configurations to join Harris, Murray, Smith and Gers on the lower section of the stage. “Wrathchild” was next, which I thought had been played back in April 2016, but apparently not so kudos to Maiden for changing their setlist a little bit. Uploaded by Bob Rich on 2017-07-16. Prior to the next track, I believe that Dickinson gave a short speech on how everybody was welcome to an Iron Maiden concert no matter their religion, sexual preferences, etc. This type of message was also communicated by Metallica frontman James Hetfield at that band’s concert the next night. Perhaps both felt inspired by Canada’s Prime Minister Justin Trudeau who is a public advocate for inclusion rather than exclusion. However, I suspect that Dickinson and Hetfield communicate their respective messages at every one of their respective band’s concerts so being in Canada was likely not the inspiration for their messages. “Children Of The Damned” was next and although I like the song, Maiden could have dropped that one for another oldie from their past to change their setlist up a little bit more from their last Toronto stop. “Death Or Glory” and “The Red And The Black” were next from The Book Of Souls. I preferred the former to the latter in terms of songs especially since the latter tracks runs for over 13 minutes. “The Red And The Black” is not quite at the same caliber as “The Rime Of The Ancient Mariner.” The crowd seemed re-energized when Maiden launched into “The Trooper” which had the crowd singing along. “Powerslave” was a treat to hear live again just like back in April 2016. I didn’t recognize the next song (“The Great Unknown”) but knew it was from The Book Of Souls. The last track played from the new album was the title track, which I thought had the most potential live given that Dickinson (from what I remember) was able to get the crowd participating for part of the song. It appears that the Iron Maiden band members still have a lot of gas left in their respective tanks as Dickinson promised that the band would be back — and I will definitely be back to see them as well. Certainly, all of the band members seemed to have a lot of energy on stage despite each of them hovering around 60 years of age (and 65 years of age for McBrain) and Dickinson‘s voice remains one of the best in heavy metal period. I should also point out that Maiden‘s stage set was simply spectacular and I would have likely appreciated it even more had I not had that awful side seat from where to view the stage. Overall, Iron Maiden gave another strong performance, which is exactly what I expected from them.